Rent a Teradek Bolt Pro 300 to stream video content wirelessly from a camera or any HDMI input source to a projector, TV or display. 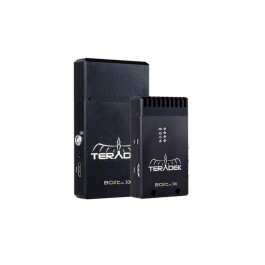 The Teradek Bolt Pro 300 Multicast Wireless Transmission System is used to wirelessly transmit video content, replacing long HDMI runs that can be problematic. It's also used to wirelessly stream video output from a roving camera to a projector, TV, or other display. This is a latency-free wireless transmission system that sends 4:2:2, 1080p60 video at up to 300 ft with less than one millisecond delay. This Bolt Pro system comes in a set of one transmitter and one receiver. The transmitter features an internal antenna and four LED indicator lights. The Bolt Pro system is suitable for exterior and interior shoots, and it features Dynamic Frequency Selection that allows it to adjust the frequency bands it's using in real-time to avoid interference. This Bolt Pro comes with one transmitter and one receiver with HDMI input and output. Camera shoe mount and battery for transmitter are included in the kit.